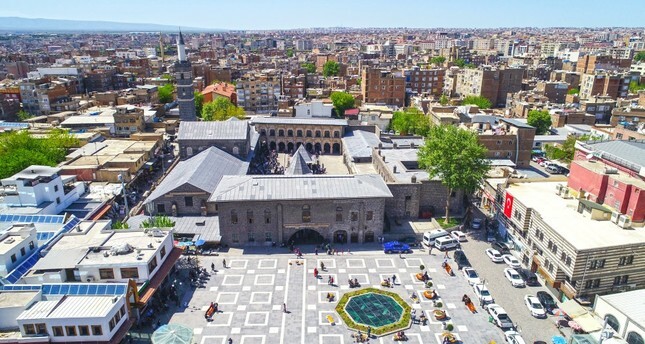 As SE provinces, such as Diyarbakır, have been affected in previous years by PKK’s destructive activities, AK Party will emphasize the ongoing change that has been taking place in the region following appointment of trustees to some municipalities. The ruling Justice and Development Party (AK Party) will follow a special roadmap prepared for various provinces in the southeast that mainly consist of Kurds, emphasizing its projects and services in the upcoming local elections. Thus, the party will give detailed information to citizens about its projects and investments in municipalities, stressing substantial change in the region with the appointment of trustees. For the local elections on March 31, AK Party organizations will avoid using alienating rhetoric to coalesce around objectives to benefit people in the region. As the southeast has been affected in previous years by the terrorist group PKK's destructive activities, the AK Party will emphasize the ongoing change that has been taking place following the appointment of trustees in some municipalities. The PKK exploited the ceasefire period between 2012 and 2015 and carried its war against the state from the mountains to the cities in the southeast. When the government had strong evidence that some municipalities linked with the pro-PKK People's Democratic Party (HDP) provided funding and support for PKK activities, it appointed trustees in elected administrations in nearly 100 municipalities. The trustees, mostly bureaucrats serving as district governors, have been lauded by the public for numerous positive changes they have brought to towns and cities. ision Board (MKYK) member Orhan Miroğlu said in an interview to Habertürk earlier this week, "Neither AK Party, nor a state or democracy can tolerate the relationship between an armed group and a political party formed under the constitution." He added that everyone in the region welcomes the service policies of the appointed trustees, yet he stressed that this is not a factor that would completely change the voters' preferences. With the appointed trustees, long-neglected infrastructure was completely renewed, new roads and social facilities were built and green spaces increased. Municipalities' debts to local businesses were paid, while schools, public buildings and other places damaged in terror attacks were renovated. The AK Party will stress that municipal budgets have been used for citizens not for the terrorist group and highlight that the current stability and peaceful environment will be maintained. To introduce its new projects, AK Party officials will come together with regional opinion leaders and inform them about the party's future plans that will prompt developments. Wednesday, AK Party spokesman Mahir Ünal said that the party's 11-article manifesto will be announced today by President Recep Tayyip Erdoğan in the party's candidate presentation meeting in Ankara. Ünal said that AK Party organization members from 81 provinces will come to Ankara and they expect the participation of 40,000 people. For the local elections, Ünal stressed that the AK Party will conduct a digital campaign where over 1 million organization members can easily contact each other. He underlined that the AK Party will conduct an eco-friendly campaign to prevent noise and visual pollution. Traditionally, during election campaign periods, political parties set up stands next to each other displaying party banners and distributing brochures in the main squares of cities. Party buses of different parties loudly play campaign songs. Prior to the grand meeting in Ankara, AK Party Women Branch Presidency met yesterday to discuss policies for the election. Currently, the AK Party has 23 women candidate in municipalities.